Effective product innovation depends on fast access to critical design and engineering data. In 2006, when Dana Nickerson first arrived at Whirlpool Corporation (the $18 billion manufacturer and marketer of major home appliances), the product development system was hampered by an all-too-common engineering problem: the inability to find comprehensive data on the thousands of parts that went into the company's thousands of products. Nickerson, now the director of global business process management for the corporate technology organization at Whirlpool Corporation, compares the situation back then to having a version of Google Earth that only lets you zoom down to the level of the U.S. "We had no more visibility into our product information than that," he says. A typical part search would turn up as many as 2,000 hits, forcing frustrated engineers to simply design new parts from scratch. That, says Nickerson, added to costs: "That required the engineer to introduce a new part number into the system, at an added cost for each new part number. Now they've introduced yet another part number and all of the infrastructure that goes with it." That situation presented Whirlpool Corporation with a fundamental business problem: "Every activity that involves parts -- supplier rationalization, strategic sourcing, part reuse -- requires detailed knowledge about all the parts and components you use. What we realized was that we couldn't reuse what we couldn't find." In today's highly competitive, global business environment, customers are stepping up demands for fresh products and higher perceived value. That, in turn, is exerting tremendous pressure on companies such as Whirlpool Corporation to devise new, innovative ways to shorten the product development cycle while maintaining high levels of quality. For a number of years, Rich Rhyne has worked to accelerate the development process at Northrop Grumman, where he's the company's manager of commodity design teams. "The biggest thing is that these systems remove tasks from designers, such as part searches and selection, which allows them to go and do what they do best -- design circuits. It's been a real gain in speed," he says. Improving the situation, however, often requires a monumental effort to rethink any number of legacy systems, complex databases, outdated proprietary engineering applications, knowledge management systems, and old-fashioned search engines. These systems depend on separate, locally stored data, and poor data management strategies that result in the rapid growth of both structured data that is already incorporated into disparate databases, and unstructured data (such as documents and drawings not susceptible to organized storage). Under such circumstances, it is virtually impossible to obtain a consolidated view of individual parts, let alone the design of a new product. Difficult as these problems are to overcome, it can be done -- but it requires rethinking your product development data architecture from the ground up. What's needed is an enterprise-wide data management approach to the problem that emphasizes making critical parts data available when needed, where needed, and in the format it is needed. This approach takes into account every aspect of the data life-cycle -- creation, verification, validation, control, archival, retrieval, and destruction. That, in turn, demands content management systems that can capture and integrate data from systems throughout the corporation, and search engines that can plow through everything from design drawings to complex relational databases. In an ideal world, product design engineers would be able to find anything and everything they need about the parts and components required for a particular design, at any time, from a single search interface. The lifecycle of products, from concept to production to retirement, would be easily tracked and managed, and the innovation process would proceed much more smoothly. To do so, however, engineers need to be confident in the knowledge that they are working from the most recent data to ensure they're making the right design decisions. That requires an effective data repository that depends on a content management system that can serve not just as a single classified data repository for engineering components. It must also allow product design engineers to create simple cross-references between a component and all of its accompanying data -- a requirements document or a testing specification, for instance. To be effective, this next generation of tools should combine the capabilities of indexed search engines and enterprise content management (see Exhibit 1 at the end of this article). Yet most engineering departments are still limited to out-of-date parametric search tools that produce either thousands of hits or no hits at all. Unfortunately, the solution is not as simple as replacing legacy search tools with a powerful, index-driven search browser. Engineering data comes in many different forms, and the same valve or semiconductor can be described in many different ways. Thus, item attributes in the form of metadata (which is necessary to assist in searches) have either limited value or do not exist at all. To properly generate the necessary metadata and obtain the benefits of a search-engine query, companies have turned to enterprise content management (ECM) capabilities to help make their data searchable. 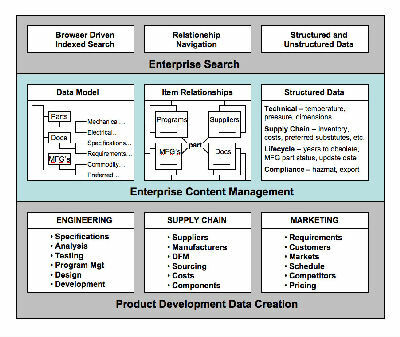 Enterprise content management sits between the applications that actually produce the engineering data and the search engines used to find it. The ECM system works like a catalog management tool, but with much greater breadth and functionality. 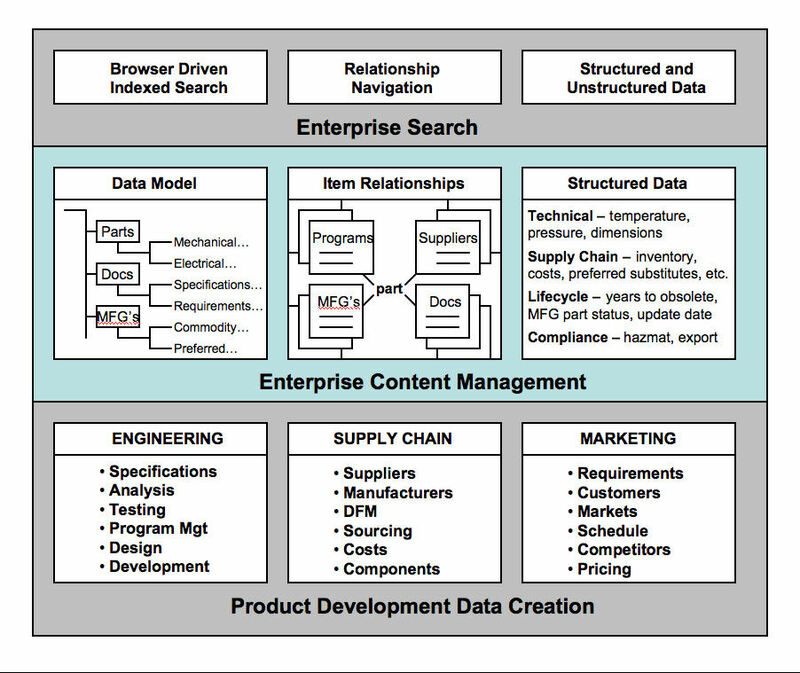 The ECM system provides short-term improvements in data organization (by classifying data against a consistent taxonomy) as well as long-term benefits in data maintenance (allowing engineers to keep up with new regulations such as environmental compliance, refinements in data attributes and taxonomy, and additions to the taxonomy from third-party sources). The process of revamping Whirlpool Corporation's parts data system began with redefining how, exactly, to describe the thousands of parts and components the company uses. Says Nickerson: "A critical activity is the process of collaboratively defining the information a company wants to capture. In our case, we needed to capture detailed attribute information about our product components -- from both the procurement and the engineering point of view." That turns out to be a very complex and very difficult process. "In Europe, for example, there are different ways of describing products and parts, and if you don't resolve those differences, you will never be able to agree on common ways of describing the various elements," Nickerson notes. "Without common ways of describing items, people will not be able to find the same thing." Besides using different naming conventions (a "toe plate" in the U.S. is called a "plight" in Europe), engineers in Europe use the metric system for measurement data while U.S. engineers still frequently refer to feet and inches. In addition, European product-compliance standards vary greatly from those in the U.S.; the use of lead, cadmium, and mercury is restricted in most electrical and electronic devices in Europe. All these variables must be taken into account. Defining the data model also involves being aware that "you don't know what you don't know," Nickerson says. Unless the data model is highly flexible and adaptive, meaning that the user community itself can mold it, then it won't be successful. At the same time, you can't make it too adaptable, because then you open yourself up to managing too many different criteria. "In the middle of those two extremes is the sweet spot." Whirlpool Corporation is now in the process of completing the data model, which involves enlisting its own local engineering experts in every product area to create and approve the parts of the model that pertain to their products, with the goal of ensuring the model conformed to how the company's technical staff would typically conduct part searches. As each portion of the data model is completed, Whirlpool turns the model over to an outsourced data-cleansing team based in India to review the engineering drawings and documents for each part and enter the technical attribute data into the database. That, says Nickerson, is pretty straightforward. Not so straightforward, however, is deploying the search tool Whirlpool Corporation's employees can use to find the information they need. "We don't need the ability to search something. We need the ability to find something. We don't want people to get 'no results found' when they over-constrain a search, and we don't want them to get thousands of results either." That's why Nickerson does not characterize the tool Whirlpool Corporation needs as "enterprise search." We tend to use the word 'navigate' to describe how the tool should work. It's really much more directed towards navigating the parts dataset because I may not know what I am looking for." Whirlpool Corporation is not yet at the stage where it can fully quantify the benefits of the enterprise's efforts to improve parts management, but Nickerson says initiative has already rung up of 15 percent to 20 percent through its improved ability to reduce variations in the prices of similar components, and he hopes to start seeing additional benefits by the end of the year. Ultimately, he believes, those benefits will go beyond lowering costs and speeding up the product cycle. "Increasing the reuse rate is great, but what if we reuse a part or component that has a really high failure rate and we don't know it? That way we just drive more cost into our operations. The key is, once we've found something that meets our specifications, then we need to find everything we can about it. What were the failures? What were the failure modes? What's the rate of occurrence?" "The development of the hierarchy is really key, because if the organization doesn't participate in that process, then you will never get the buy-in you need. And without that, people won't use the end result or see its value, and they'll just keep on doing things the way they have always done it." The key to improving product development cycles is to arm engineers with the right information at the right time. With such large volumes of data being generated and consumed as part of the product development process, a truly workable engineering data system is sorely needed. By bringing together all the necessary engineering information from across the company to support engineers in making critical design decisions at key junctures, companies can begin to unleash the true value of timely, innovative product development. This figure depicts the magnitude of the amount of data generated and then managed throughout today's product development lifecycle. Enterprise content management (ECM) makes it easy to structure this data, establish relationships to related items, and prepare the data so it can easily be found and reused. Enterprise search makes it easy to navigate the structured data index provided by ECM, providing a consolidated view of a part, so that a few simple search queries can quickly retrieve the information needed.